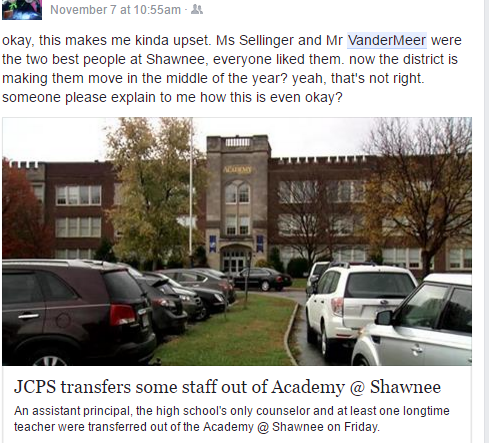 The Academy @ Shawnee has been in the news a lot recently, but the truth is not what the district leaders would have you believe. We’ve been begging for their support for years, and instead of flotation devices, they throw us bricks. Students need supports and interventions, they respond with retribution. In the meantime, the comments from community reveal that there is more to the story. It reeks of adult-driven agendas and retribution, not what’s in the best interest of the students. Here are some of the posts and comments from Facebook. 1:08i sent an email to all of you but last week with some of my concerns and dr. This letter was presented at the JCPS Board Meeting on May 10, 2016 by Dear JCPS Co-founder Gay Adelmann. That’s when I said, “un uh.” These are our schools. Our kids. Our tax dollars. So we started Dear JCPS. And that’s when we found many more who were been beaten down, ignored, had issues swept under the rug. Parents who had no choice but to resort to lawsuits. We were drawn to each other like a moth to a flame. Suddenly, the district’s ability to “ignore the problem long enough so that it would go away” was in jeopardy. Repeated attempts were made to discredit and derail our group. Because district leaders did not authentically respond to our questions and concerns early on, they appear to have a hidden agenda. And now, the district’s lies and misdeeds are becoming undeniable. When you sign off on out-of-touch recommendations that are obtained with no genuine input from stakeholders; when we are asked to pick one of three options, of which two are not even viable, that is not brainstorming. That is manipulation. A state senator “shadowed” my son yesterday, but some of our district leaders, entrusted with making some of the most important decisions in our city, can’t be bothered to do the same. Public education is under attack nationwide. Your complicity that allows them to undermine the success of our district, and expedite — not thwart — its demise, is criminal. Your negligence is not only filling the pipeline to prison, it is filling the pipeline to the morgue. Two of my son’s classmates have been murdered this year. Imagine if you lived in a war zone, not knowing if you or someone you loved could be killed at any moment. And you are required to come to school – in many cases bused across town — and forced sit for ridiculous tests and test prep that do not teach you what you need to escape the war zone, but instead are used to label and place more hurdles and burdens in your way. Yes! We need a more equitable code of conduct, but more importantly we need the supports in place to make sure it’s successful. These are our children’s lives and futures you’re playing with. We did not elect you to boost your resume, to satisfy your philanthropic goals, or so you could throw your influence around on the golf course or the board room. We elected you to fix our broken school system. If you think the media is to blame for this debacle, you’re still not getting it. But the community is – and we’re outraged. Our school board is our last hope to save public education in Louisville. You either take this bull by its horns, or we will VOTE YOU OUT! When the board voted to accept KSC’s Proposal (and related KSC Cost Schedule Form) to run the Challenger Learning Center this summer, Dr. Hargens assured us the proposal would “greatly expand the number of (JCPS) students who benefit and learn from the Center, there will be no interruption in service.” She has said on numerous occasions that she is dedicated to adding more STEM enrichment to the JCPS curriculum. KSC’s proposal that the board approved on July 26, stated that they would fly 150 missions this school year (which was actually the same number as CLC last year – not 30 as the proposal suggested). Cordelia Hardin told the paper that the Kentucky Science Center has “big plans” for the Challenger Learning Center, which includes adding more missions, having birthday parties and it will be open on the weekends. As we approach the halfway mark in the 2015-2016 school year. On behalf of our stakeholders, and in keeping with the Dear JCPS mission of advocacy and accountability, we would like to ask for an update on the Challenger Learning Center under the new operator. How many missions have they flown so far this year? Should be around 75 by end of year? How many of the wildly successful, newly developed Micronaut missions have been flown? How many JCPS students have been able to experience this STEM learning opportunity? No interruption in service to us implies the ancillary benefits to the host school: The Academy @ Shawnee. How have they been doing in that regard? As stakeholders who expressed concerns about the abrupt decision to make this change, compounded by advisory board members, Challenger Center staff and franchise owners, and other valued stakeholders not having a seat at the table when these conversations were taking place, we would like to ask for a follow up to put our minds at ease that Dr. Hargens promises are being kept. We look forward to your follow up on these questions, and hope that Challenger is indeed being afforded every opportunity for success. My name is Gay Adelmann, and I am here speaking as a parent of a student at the Academy at Shawnee. This letter is intended to help you understand a real world challenge that has been happening at one of our lowest performing schools for nearly a decade, maybe longer. In 2008 after the McFarland v. JCPS ruling and the student assignment was revamped, Shawnee was the only school in the district not to receive any accommodations from that decision. The story that made the front page of the Courier Journal. The Board unanimously voted to make the school K-12 to compensate for this disparity, but it was never implemented. Nothing was done to correct this disparity. The school was ranked in the #1 percentile. I wish that was a good thing. It was the worst performing school in the state. We knew that when we selected the school from the Choices catalog. But my son wanted to be a pilot. We visited the school and we realized the potential that was there. It had a dynamic principal. We saw the promise. The potential. Everything was in place for a turnaround. The resides population is high poverty (90% free and reduced lunch), high transient population, high truancy, high special needs. These gap kids are not keeping up across the district. And we still have the disparity I mentioned earlier. The Board approved adding a magnet-only middle school to help grow the high school and raise the scores organically. But that would take time, and the magnets currently only made up about 10% of the total school. “Maybe if we could grow the magnet, we could raise the high school test scores sooner,” I thought. However We met our goals – went from 1 percentile to 9th percentile. Wow! Then Beginning of the school year, the District Came out with “The Plan,” went thru 2 interim principals, but with no ownership, there was no one on the ground assessing what would help us meet our goals. We came before the board. We Said “Wait, Principal before plan,” and you listened. Myers Shut down – Our brand new magnet only middle school in its first year, suddenly had to absorb a population that we weren’t ready for and that wasn’t ready for us, and increased our MS population by more than 50%. Moreover, the resides middle school students who are assigned to Shawnee MS were not our resides HS students. So we’re working to grow them, but then we’re going to lose them. Following year, more teacher turnover, went from 5 Nationally Board Certified teachers down to 2. I made “recruiting” my GCIPL project. Went to various events, recruited students interested in aerospace, which is an 8 billion dollar industry and is the #1 export in the state of KY.
Middle school scored highest in the district. Now, if we could just get more magnet students here, we could grow the scores. Middle school scores dropped 24 points. Challenger was put on hold and defunded before a new plan was in place. Principal on leave 2 weeks before end of school year, GCIPL project came to screeching halt. Leads dried up. Open house fell thru. Another lost recruiting year with uncertainty of no principal, and loss of challenger looming. Asked for consistency. Promote from within. Principal from another school named 1 day before school starts even though the position had been open all summer. With new leadership comes more change, more staff turnover. Lost another AP last week. How is that consistent? 10 weeks into the school year and we still need 3 critical teacher positions filled. Math and English. Met our AMO. Went from 9th percentile to 16th percentile. On my son’s 5th principal. Every time someone new comes along turn the ship around. Unfortunately kids get caught in the wake. No consistency in a school where consistency found more than anything. Priority schools should come first. Yet it’s nothing more than a label. There’s no sense of urgency. Don’t want to keep waiting until next year. More kids are caught in the wake every year. We are being held accountable for things beyond our control. Don’t have an SBDM. 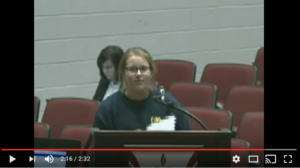 Parent and teacher input is heard but ignored. Don’t have KDE $ or support. Our staff know what they are doing but every new administration comes in and tells them to do it different, just when we start to gain momentum, something cuts us off at the knees. Our kids can’t wait until next year. The school and staff are amazing. We don’t regret a minute of our decision. But we feel like the red headed stepchild. But we are really the best kept secret. Aerospace is growing. The time to act is now. With loss of Challenger, we are no longer part of the conversation, no seat at the table in the aerospace industry. With no more funding and no more KDE support, HOW WILL WE EVER GET OUR OF PRIORITY STATUS? NEXT YEAR OR EVER? What is the district going to do differently willing to do to truly make us a priority? 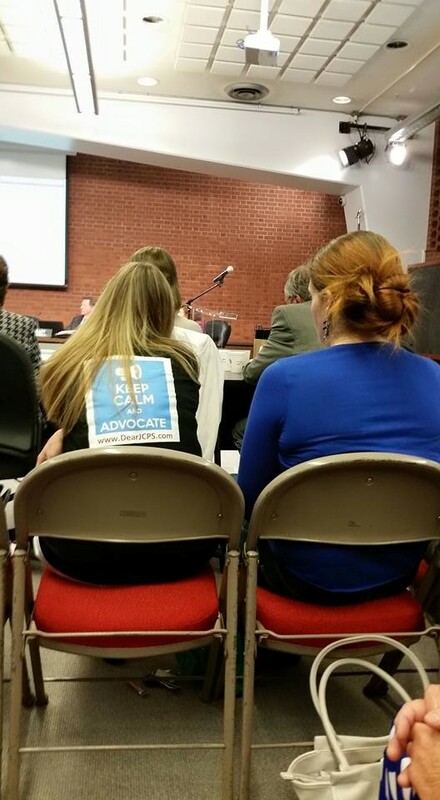 @Dear_JCPS Representatives were present at Monday night’s board meeting to speak about Challenger Learning Center prior to the board’s vote. Gay Adelmann and Erin Korbylo brought up concerns they hope KSC’s Proposal (and related KSC Cost Schedule Form) — which were not available for public viewing until after approved Monday night — take into account. Here are a couple of stories that were posted after Monday night’s meeting. The proposal contained some errors, incorrect assumptions and outdated information. With misinformation like that, no wonder JCPS thought they needed another plan. One board member we spoke to after the meeting Monday night said he had thoroughly reviewed the proposal, however when pressed for what the $75,000 would be used for, he indicated it would be used to cover the $16,000 annual franchise fee, among other operational costs. However, according to the RFP, the franchise fee is tacked on as an additional expense to JCPS. And the proposal itself makes no reference to what the money goes toward, so we’re not sure where he got that idea. It appears to simply be a fee JCPS is paying KSC to run the center, regardless of how many missions they conduct or revenue they bring in. In addition, none of the board members we talked to knew how much JCPS students would be charged for each mission. So another concern we have is that since under the former arrangement, JCPS students came through at no cost, (their fees were covered by grants). If JCPS now has to pay $500 per mission, and sends 150 missions through, they just added another $75,000 to their overall cost allocations, they just moved it to a different column in the budget. So, let’s see, we’re at $75,000 fee to KSC, $75,000 for JCPS students to come through, $16,000 for franchise fee. That’s $166,000. 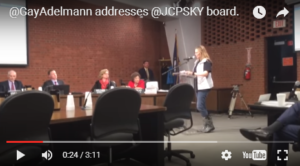 And once they bring in the anticipated $5,000 – $8,000 that KSC expects to pay JCPS based on their 10% mission revenue, the district will be on the hook for about $158,000. Compare and contrast the supposed $250,000 was costing them (because it included a teacher’s and the acting director’s salary) we were unable to verify this is an apples to apples number), and subtract the $54,000 in grants they brought in as revenue, and adjust for the 3000 students who came through for free (a $75,000 value), and we’re at $121,000. Sounds like we just went in the wrong direction. And that doesn’t account for the estimated $250,000 to $500,000 in donations they were anticipating they could receive from the work they had done with a fundraising firm they engaged in the spring. This is a STEM teaching program, not just a field trip, so another slippery slope that this brings up in our opinion is that they considered the teacher “an expense that was not paying for itself,” so they decided to eliminate it. Teachers are not here to bring profit to JCPS, as far as we’re aware. They’re here to teach, and that is what this seasoned science teacher was doing. In fact, she rewrote the mission curriculum to integrate with Kentucky Next Generation standards. And developed a hugely popular and successful Micronaut mission for the younger grades, which KSC does not plan to continue, according to their proposal.